Spending time in the great outdoors is a true treasure to experience, and does the body, mind, and spirit a whole lot of good. Camping is a way for us to reconnect with the Earth and remember the simplicity of our basic needs. It’s also an opportunity to do some delicious cooking over the flames of a campfire! This vegan paella is a super easy spin-off on a classic Mediterranean dish. Not only is it a delicious comfort food that is fun to cook outside, it is also good for you! The variety of vegetables provides a good source of vitamins, minerals and fiber, while the chickpeas offer some protein. This dish serves 2 people, or one very hungry person! Just double the recipe for a family of 4 (and get an extra large cast iron pan). Start a small fire in a designated campfire pit. Place the saffron in a bowl with 1 tablespoon of hot water and set aside. Over a small flame (or very hot coals), heat the olive oil in a cast iron pan, add the garlic and onion and cook for 2 minutes. Add the red pepper, mushrooms, tomato, smoked paprika, turmeric, chilli, bay leaf and cook for 3 minutes. Add the rice, saffron liquid, vegetable stock and a pinch of Himalayan sea salt if needed. This is when you will want to have a larger flame for your fire, as you will now bring the contents of your pan to a boil. Once a boil has been reached, you can let the fire die down slightly (or place the pan to the side of the grill) and cook over low heat. Cover the pan with a lid at this point (you can also use tin foil if you don’t have a lid). Cook for approximately 15 minutes (or until most of the liquid has been absorbed), shaking the pan every few minutes. 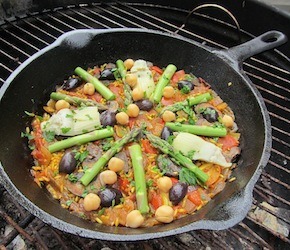 Add the asparagus, chickpeas, artichokes and olives on top of the rice (get artistic if you like! ), and don’t stir. Put the lid back on and let it cook for another 5 minutes. Remove from the fire, add the chopped parsley and let the pan rest for 5 minutes with the lid on.